Strategic Reframing, by Dr. Rafael Ramirez of Oxford Said Business School and Dr. Angela Wilkinson, Head of Strategic Foresight for the OECD, aims to provide the leading guide to scenario planning – with a particular focus on corporate strategy and public policy. Undoubtedly it is certain to become a well-thumbed fixture on the bookshelves of serious scenario planners and foresight practitioners. As an alumnus of the Oxford Scenarios Programme I have been waiting for this book, since I took the course two years ago. 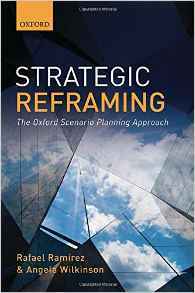 Strategic Reframing, as the subtitle seeks to promote the Oxford Scenario Planning Approach, however, in doing this, it makes some valuable contributions to the scenarios library. Strategic Reframing is not a ‘how to’ guide on running a scenario planning workshop, though this subject is covered well. It is a guide on how to become a scenarios expert – what are the serious high-level issues you will have to deal with if you want to run regular, impactful and varied workshops? The authors place emphasis on the scenarios practitioner’s responsibility in designing each of their scenarios workshops appropriately, presenting the readers with a range of issues to be considered when designing workshops, rather than an off-the-shelf solution. As a result, the book raises more questions than it answers, and is somewhat vague and flexible in its recommendations. Such an approach, however, is its strength – it is helping you ask the important questions (for example, what conceptions of time are you using for your workshops? ), rather than giving you easy answers. Scenario planning is a practice-led field with origins in industry, more than academia. As such bridging the gap between practice and theory has presented a somewhat of a challenge for the scenarios community in recent years. The book therefore also seeks to bridge this gap. It helps readers understand the different theoretical options available when designing scenarios workshops. Again Strategic Reframing succeeds in this regard. It will be of especial use to postgraduate students and other academics who need a clear understanding of the ontology, epistemology, and methodology of their research. The book also includes a very thorough reference list, which will keep enthusiastic readers occupied for years to come. The areas the book covers include the theoretical foundations of the Oxford Scenario Planning Approach, scenario planning as a social and knowledge acquisition process, how to teach and to ‘do’ scenario planning and the current gaps in scenario planning understanding and thus the areas where future innovations in the field may arise. The book has a number of useful diagrams which will likely become staples of workshop notes and papers, such as the ‘contextual and transactional environment’, ‘three arrows of time’, ‘iterative learning cycles’ and ‘reframing-reperception interconnection’. My copy is already well thumbed and littered with pencil notes. It provided valuable assistance in my recent PhD-research scenario planning workshops, where the chapters on the theoretical foundations of scenario planning and how to run scenario planning workshops were particularly useful. For those seeking more practical advice on running scenarios workshops, in addition, there are seven detailed case studies of scenarios workshops in the appendices. All of the case studies are of major organizations (Wartsila, Shell, United European Gastroenterology, Aids in Africa, European Patent Office & Risk-World). The case studies should help scenario planners bridge the gap between the theory in the book, and the reality of running workshops. In line with the authors’ views, it seems to me there are too few descriptions of previous scenario planning workshops publically available. In particular, discussion of past successes, and more importantly failings, in scenarios workshops is absent from the general literature. The appendices in Strategic Reframing will, therefore, begin to address the gap, and thus presented one of the highlights of the book for me. In summary, this book will be a fixture on any serious scenario planners bookshelf.